Thanks, J! I had great fun writing this one, entirely inspired by him taking pics of me knee-deep in fluff. Sometimes it takes someone else laughing at me to make me realise I’m being goofy! Seemed perfectly ordinary up until he took pics. Did you just put The Bananna Splits theme into my head?!?! If there were exams for cleaning I’d fail them miserably. Sometimes there are dust-balls the size of triffids under our bed. I have at times been quite worried that one may engulf us in the night. 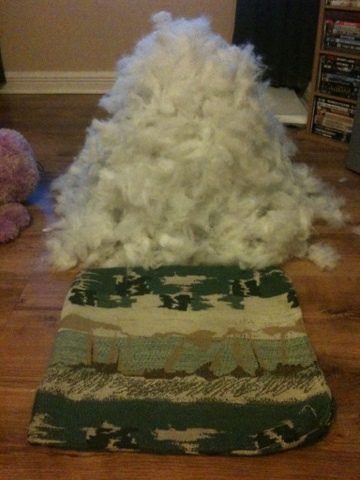 Anyway, good for you for being so industrious – and I’m so glad you’re re-fluffed! Neko blows her coat twice a year – the ‘tumble-dogs’ are immense. Sigh. You sound just like me. I have a lot of crap too, I refuse to get rid off. It comes in handy, that stuff! Ever get a Kinder Egg? I feel terrible that I know no children to give the well-made toy inside to. And I hate throwing them away. But what do I do with them? Aaaaa…..! Kind/kinderen = Child/Children in Dutch. Even in the US they say kindergarten! I love English with all its words from everywhere else 🙂 Do you keep the toys? I haven’t bought them in ages. But yes, I keep the toys! You posted pictures of piles of fluff. 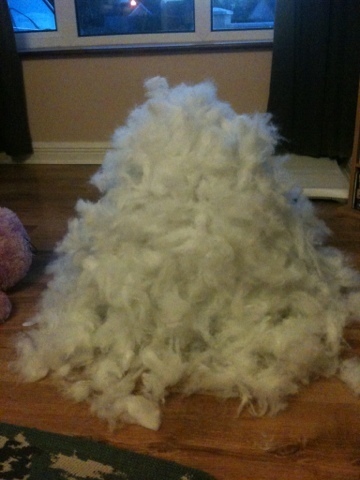 I have never seen pictures of piles of fluff on the Internet before. This may be a first. I’m going to Google “piles of fluff” and see if your name comes up, Spiders. Imagine a world where in which there is a use for dust…. 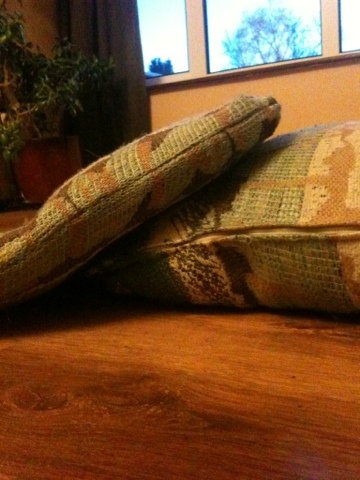 My dearie you really hit it home with that last bit about rolling off the back of the newly fluffed pillow! I nearly peed myself from laughter! Serves you right for saving money and doing this on your own 😉 It twas just the pillow playfully giving you a “good job” shove on the arm as a thank you for not throwing it away!